The mobile communication industry in Africa can be rightly described as a great enabler of the shift in the African story to the positive. Countries such as Nigeria had no solid Telecommunication service before the introduction of GSM in 2001. The story is similar in many African countries. Mobile phones are great tools for fighting poverty and has increased efficiency in our everyday live. The industry is presently at a crossroad as it is no longer new and revenues are dropping as consumers become more discerning. Customers also want to have a one stop shop for all their IT needs. This means that mobile network operators have to start seeing themselves as more than network operations. 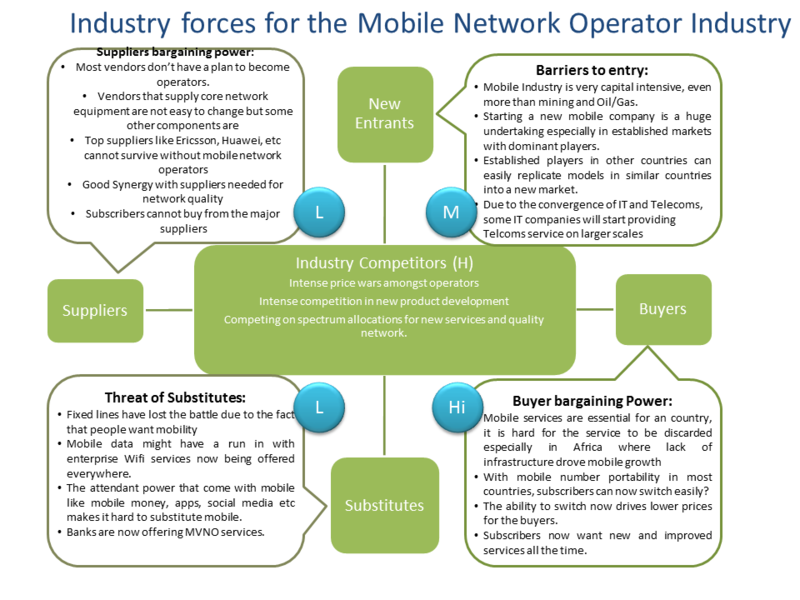 The following is an attempt to analyze the industry trend that will assist the mobile network operators to remain competitive and relevant. 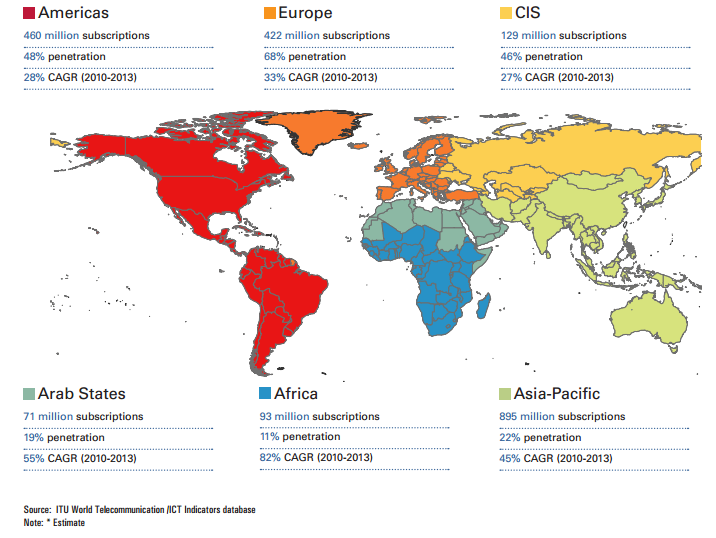 Mobile penetration is growing at a high rate in Africa. The absence of a highly developed fixed broadband ensures this. 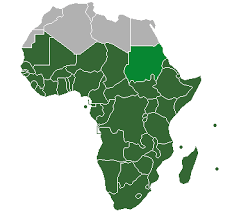 In June 2013, there were 253 million unique subscribers in Sub-Saharan Africa (GSMA, 2013). As at the end of 2013, there are 93 Million mobile broadband subscriptions in Africa which is an 89% CAGR over 3 years (ITU, 2013). There is still a high potential for growth as penetration presently stands at 11% (ITU, 2013). As the subscriber base grows, the opportunity to grow the service industry also grows. The evolution of mobile broadband in Africa has seen some networks already rolling out the long term evolution, which provides very high speeds comparable to fixed mobile networks. 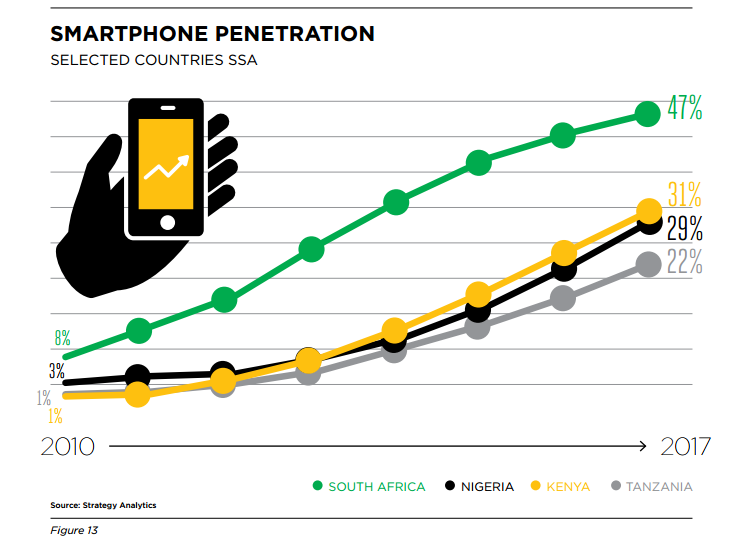 Smart phone penetration is growing in Africa due to falling prices of the devices. China is a big contributor to this with mass production of smart phones. Lower costs of these phones are very important due to the fact that up to 87% of Africans access the Internet mainly via mobile phones (GSMA, 2012). Feature phones that are not smart phones but still have mobile data capabilities contribute to more mobile internet uptake. Smart fridge, smart cars, etc are now realities. Need for network operator services are no longer limited to people and their phones but machines. Ericsson estimates that about 50 Billion devices will be connected by 2020 (ITU, 2012). This means that subscriber base would no longer be counted by the number of humans but by the sheer number of devices also. Your fridge would be able to send you SMS about dwindling stock; cars are already geared to send SMS to remind you of service time. Subscriber traffic comes with valuable information. This information provides great insights that can be used by various industries especially for marketing purposes. Telecommunication providers still do not understand how to fully use these data. This provides an opportunity to use the information to create new revenue streams for both the telecommunication company and the industry. The industry has matured and this is giving mobile operators an advantage. Mobile operators now understand their business better and have better technology knowledge that has now enabled them to put their suppliers in check. The rise of the Chinese Telecoms vendors has also improved the costing in the industry as they now give competitive pricing that has caused problems for their European competitors. Subscribers are now spoiled for choice and it is now easier to switch network operators whilst maintaining the same number. This has brought a lot of quality improvement approach by the network operators in order to avoid CHURN. The forces will be explained in a future post.